For millennia, droids had filled an important role in Republic society. They were tireless workers, trusted servants and often functioned as diplomatic translators. Battle droids formed a key part of the Republic's military strategy. However, a "droid rights" movement began to find a voice across the Republic and quickly became popular on Coruscant. The argument was made that since droids had personalities and sentience, owning a droid was tantamount to slavery. The Galactic Senate dismissed the movement as a mere fad, but after millions of appeals to create a Droid Rights Bill, they were forced to address the issue. A surprising number of Senators spoke up in favor of droid rights, while many others dismissed the idea as absurd. The debate would continue until the Great Droid Revolution stopped the droid rights movement in its tracks. 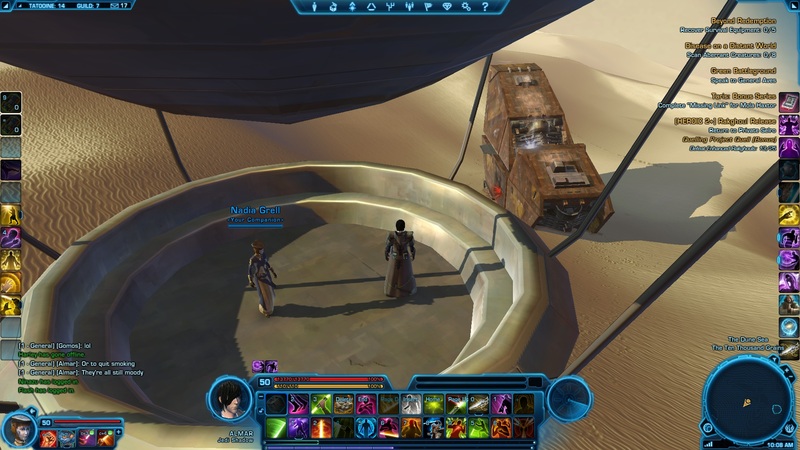 To get to this Datacron you will need to first go all the way southwest in The Dune Sea to the Sandcrawler almost off of the map (Screenshots 1 & 2). The Coordinates to this Sandcrawler are -2336 , 465. Once here you will have to wait for the Jawa Balloon to make it's rotation over to you (Screenshot 3). The balloon takes about 40 minutes to do a full rotation so you could be waiting here for quite awhile. The good news though is after this extremely long wait you will be able to collect two Datacrons from ontop of the Sandcrawler! If you're bored something you can do in the mean time is browse my website! Every letter in this sentence will take you to a different page. Visit them all and you're cool! Well that took forever to make and the balloon still isn't here! Once the balloon arrives you won't have long to hop on, so make sure you're paying attention and be quick about hoping on! Once you see the balloon in the distance you have about five more minutes to browse my website (wishful thinking, right?) or to keep going AFK. By then it will be really close and time for you to hop on board. Once on board you will be riding the balloon out until it is far northwest. Here you can see a picture of me going along for the balloon ride (Screenshot 4) Now I'm almost there... (Screenshot 5). Just a lil bit more.... (Screenshot 6). Once you reach the Sandcrawler you will need to jump off the eastern edge. You'll know when to make the jump, just wait patiently until all you see is the Sandcrawler below. At that point you just literally just run off if you'd like (But don't! Obviously just incase). I made the jump! Here is our first reward! (Screenshot 7 & 8). After you collect your first Datacron make your way around the Sandcrawler until you come out to where I am in (Screenshot 9). Be very very very careful, you wouldn't want to mess anything up now! From where I am standing in Screenshot 9 make your way around to where I am in (Screenshot 10). Slowly from this area put your back down to the ledge below and jump up repeatedly. Each time you jump hit whatever keybinding you have set to make your character go backwards. It will take awhile but it's important you don't miss this! Finally you'll fall down right where the Datacron is and bam! You're done! (Screenshot 11). You've now successfully collected two of the most annoying Datacrons in the game! The Sandcrawler you need to wait on for the Balloon. You can actually see the Balloon in the distance. Location on the map of the Sandcrawler you need to wait on. Riding the Balloon to the next Sandcrawler. Almost at the next Sandcrawler. Been riding this thing for almost 20 minutes! (The Balloon despawned between this screenshot and the next one, leaving me high and dry. I was mad so I logged off for the night. That should explain the time difference in the screenshots if you were curious). I can see both of them! I made the jump down to the Sandcrawler! You have to jump off the eastern edge of the balloon. Location of Strength and Blue Matrix Shard Datacrons on the map. After you get the first Datacron come to where I am. Shimmy around the edge until you see what is right below me. Slowly back up and jump off the edge. I took small little jumps the entire time.